This is a very tricky one. 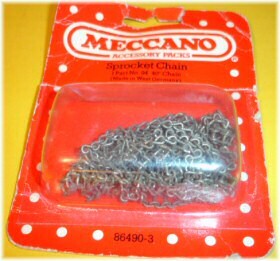 Sprocket chain was introduced in late 1915, just in time for the big Meccano competition announced late that year. 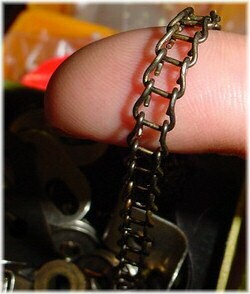 It replaced the previous "Length of chain", part number 42. However, these were completely different parts. The old chain was a simple linked chain intended for use as infill tension members in a large model, and was rather overlooked. It doesn't appear that it was ever designed to transmit power (although this was suggested in the manual it would have been very unsatisfactory). Of course, there were no sprocket wheels until the new chain's launch in 1915. 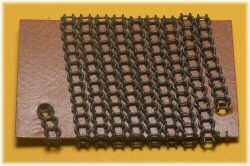 Sprocket chain was introduced well after very similar parts were added to the American Model Builder system, with which Meccano was deep in legal argument at the time. It's interesting that many of the features of this system were 'borrowed' by Meccano exactly at the time that Meccano were complaining of their ideas being stolen. What doesn't add up, however, is how it ended up as part number 94. The previous part number chronologically was the Centre Fork, part 65. 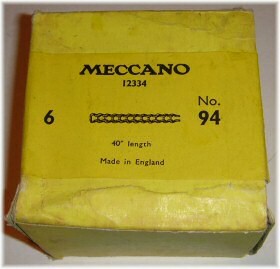 Meccano started to reserve chunks of ten numbers at a time: the 70's for the new flat plates, 80's for screwed rods, 90's for curved strips, 100's for the braced girder and loom parts. It's still odd, though, that all of these parts predate the sprocket chain and wheels. I don't really get it. 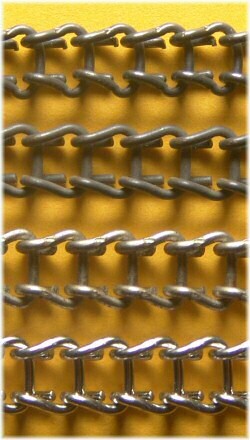 DMS/EMP describes a number of different thicknesses of chain, from 19 to 23swg. I haven't managed to find any chains at all of these sizes, so we'll need to keep looking. Very very tricky indeed. Here are four fairly well dated versions of the chain. The top one is clearly identifiable as a 1920's variety. The bulbous links are distinctly different from later versions. The second one is a 1950's chain, and probably the most common variety. I believe that this style dates from pre-war but goes through to the 1960s at least. The third variation is a zinc-plated one from the 1970's, and the bottom one is a bright zinc plated sprocket chain manufactured during the late 1980's, and supplied in the French-sourced outfits from 1985 to 1992. The interesting thing to note here is that the first and third versions have clear markings on the wire loops in the middle of the arms. This is a manufacturing mark where the wire is gripped by the machine. The second (common Meccano version post-war) and the post-Binns Road French version don't have this mark. DMS/EMP describe the various versions as 19SWG, then a very thin version of 23SWG, then 21SWG zinc plated. I can't relate this at all. The first two examples above are 0.036'' (0.91mm) diameter wire, which is 20SWG. The last two examples are slightly thicker, 0.039'' (exactly 1.00mm) diameter, which is close to 19SWG. So I can't relate any of these variations to their figures, sorry. No doubt someone will help me out here. The earliest version above is certainly common in the 20's and I have it in a 1929 manufactured outfit. The last one is also certain in date, as is the third (identical to the one in the main picture at the top, from a mid-1970's 8x outfit). The second version in the picture above is by far the most common in my experience, although I mostly collect 1945-1958 parts and outfits. The transition from the early structural chain to ladder chain is difficult to identify. The picture on the left shows a very early brass-plated ladder chain in an almost-mint outfit 4 of 1914. There are two problems with this picture, though. The first is that outfit 4 shouldn't have chain in it at all. The second is that the chain that would be expected in an outfit 5 or 6 of this era is the earlier part 42 simple link chain rather than ladder chain. However, in the picture on the right of the ill-fated Meccano Water Motor (scan of the 1914 Meccano manual, from Rémi Lanne's website ), we can clearly see very similar ladder chain supplied by Meccano during 1914. 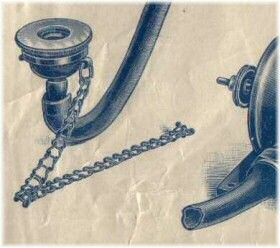 It is quite possible that part 42 (the link chain) was replaced by ladder chain around this time, and this part was subsequently renumbered as part 94 in 1915 to go with the new sprocket wheels. The chances of us being able to be certain about this kind of detail on such an old and unusual part are very small, of course. We need to be aware that there were two different types of chain around. In particular, American Model Builder had a similar chain from at least 1913, and it is very possible for chain in early outfits to have been substituted by a previous owner of an outfit. Not variations on the parts, but variations on the way it's packed. The picture to the right shows four different labels on the sprocket chain as supplied in the Gears Outfits. The top picture has a blue diamond with sharp corners, from 1949 (pre-1950 diamonds on all cellophane packs are thought to be sharp-cornered). Below this, a 1950 pack with a blue label and rounded corners. Third one down is a 1956 Gears Outfit, the yellow label has rounded corners and red printing. The bottom one of these four is not from a Gears Outfit, it's from a light red/green "M Series" outfit 7A (M series outfits are named after the large M on the box lid, and date from 1962 to 1964). This chain has an unusual label with rounded corners on the sides but sharp corners top and bottom. I have a mint Oct 1958 dated set with the chain cello wrapped with the red lettered diamond. It also includes (on the bottom of the label) the number 57704/1. The image to the right is from a 1929 outfit 7, where all the sprocket chains (6 lengths of 40'') are supplied wrapped around fibre 'cards'. Some parts of this outfit are manufactured in the early Belleville factory in France, but it is not known whether or not the chain was from Binns Road. 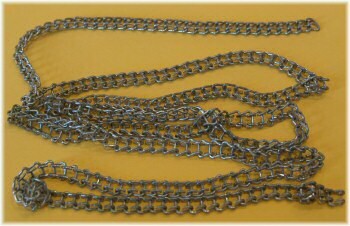 It is identical to the usual 1920s chain as shown in the top of the set of four chains in the picture above (including the twist marks), so it was most likely made on the same machine. Very tricky things to find in spare parts boxes, these chaps. Here's an unusual pack of six sprocket chains in a dealer spare parts pack. The white label on plastic bag shows this to be a part from the 1970s. And to the left, a box of six part 94 dating from the late 50's or 1960's. The product code on this box, like the bag above, is 12334. Compare this with the note above from Greg Rahn about the strange part number 57704, believed also to be a pack of six sprocket chains. To the right, a late Miro-Meccano chain as a spare part. Note that this chain is shiny, and is most likely French production. The reason there might be some doubt is that we have this chain shown to the left, from 1981 (during the short Airfix period). The pack is marked "Made in West Germany". We know that the chain-making machine(s) from Binns Road were sold off when the factory closed down, and obviously new production of some parts was outsourced. This particular chain is noticeably duller than 1970s UK chain or later French chain. Note that the part now has yet another code: 86490-3. Hallo do you know if Marklin version of meccano chain has slightly larger links? 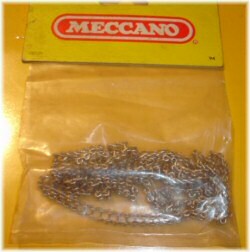 I purchased a chain type 2 ("the most common variety") but it doesn't fit my Italian Meccano gears (BRAL brand) probably due to the tooth shade. The same trouble width the transimission gears of an old Steam Model: the Meccano chain doesn't fit well. I am looking for bright brass plater ladder chain for my old Waterbury tall clock. It has 40 links per foot. Most chains are 43 links. Thanks for your help. 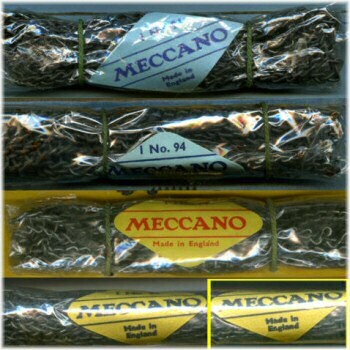 I make ladder chain for meccano. It may be too late, but I have 2", 1-1/2", 1" and 3/4" nickel-plated sprockets on Ebid at the moment, username "PatThePirate". I'm prepared to reduce the prices for sale if you still need them. No chain, though. You can email me at themclays eirccom.net if you like.